We've all heard of "extreme couponing" and the bazillions of dollars you can save, but you don't have to go hog-wild to see extravagant savings. We've seen people do some pretty remarkable cutting-back on household items and using every scrap of food in their house. But if you think that these techniques are too over-the-top for you, there are a few things that you can do to reduce the amount of money you spend on groceries and household items, without going so green that you start looking like Kermit the Frog. If you get the Sunday ads, you get an overwhelmingly large stack of clippable coupons for everything from milk to dog food. If your family doesn't mind trying new brands of products, it's wise to spend $2.00 on a Sunday paper (or get a Sunday-only subscription) and clip the coupons of things you use often, just in a different brand. This will not only save you money, but will help introduce your family to new flavors and products that you'd never thought to try. Just a couple coupons can save you some serious cash at the check-out register. 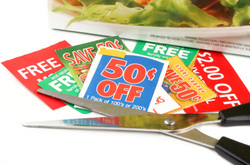 Some grocery stores (such as most branches of Kroger and Meijer) will also double your coupons up to $1.00. This means that if you have a $1.00 coupon, they will give you $2.00 off at the register. This adds up VERY fast, and can help you cut dollars rather than dimes from your bill. Extreme couponing is all the rage these days, there are even shows about it! But you don't have to be an "extreme couponer" to join a coupon club. I am a member of a Coupon Club called Clippers 4 Change, and their motto is "small changes make a big difference". The person that runs this organization goes out to Kroger and Meijer and makes a list of EVERYTHING that is on sale, and distributes it to members in an Excel Document. You clip your own coupons, and save them until the item goes on sale. Simply use the list provided to choose which items to purchase, and save. You can go extreme and clip 3 newspapers worth of coupons, and stock-pile your pantry with millions of things, or do what I do, and just purchase things I'd normally buy, but at a HUGE discount. Many of the items are already on sale, and with a double-coupon, end up free, or less than 10 cents each. Clippers4Change collects items you purchase but don't plan to use, and donates them to Charities such as Children's Miracle Network, Soldiers overseas, and local families in need. 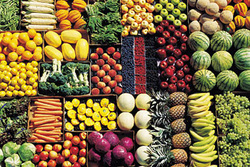 Buying fresh fruits and veggies can save you a LOT of money almost instantly. The next time you go to your local grocer, compare the price of one pound of fresh fruit to a bag of frozen fruit. The difference is almost astronomical! When you buy frozen foods, you're paying extra for the processing, packaging, and preparation of the contents. Makes sense why it would cost more. Fresh foods can be prepared and frozen, or frozen raw to extended the life that you get. Additionally, if you buy fresh, you can ensure that the foods are prepared the way you want, and also discover some tasty combinations of flavors that can't be found in any store. One of the best places to purchase fresh food is a Farmer's Market. My community has a couple really nice Farmer's markets, one of which runs year-round. Prices are usually really reasonable, and you have confidence of knowing where your food is grown. Most Farmer's Markets also have a wide selection of meats and dairy, too! The decision to purchase any Certified Organic items is completely up to you and your family's budget. Some families choose to live on Organic products alone due to personal beliefs, while others purchase based on toxin levels in food. Due to the amount of pesticides and additives in foods today, it might be smart to purchase a few items from the Organic section of your grocer. But before you go out and start buying cart-fulls of Organic Produce, you might want to read up on the "Dirty Dozen", which outlines the 12 most contaminated, as well as the 12 least contaminated fruits and veggies. The EWG also has a very helpful Summary of Pesticides in Produce.